New York Rangers President and General Manager Glen Sather announced today that the club has agreed to terms with forward Kris Newbury on a new contract. Newbury, 30, skated in 65 games with the Connecticut Whale of the American Hockey League (AHL) last season, registering 25 goals and 39 assists for 64 points, along with 130 penalty minutes. He established career-highs in goals, points, shots on goal (221), and power play goals (seven). Newbury tied for 10th in the AHL in points, 18th in assists and 15th in shots on goal. He led Connecticut in goals, tied for the team lead in points, ranked second in assists, shots on goal and penalty minutes, and fourth in power play goals. Newbury posted a team-high, 18 multi-point performances, including his first career hat trick in the season opener on October 8 at Adirondack and a career-high, four-assist effort on December 16 against Bridgeport. His four-assist effort began a season-high, eight-game point streak through January 2 at Portland, registering 17 points (five goals, 12 assists) over the span. Forward Kris Newbury, who first came to the Blueshirts in a 2010 trade, has played parts of the last two seasons in New York while splitting time with the Connecticut Whale, where he has been one of the AHL team's top scorers. In the playoffs, Newbury recorded one goal and three assists, along with 20 penalty minutes in nine games. He tied for fourth on Connecticut in postseason points and fifth in assists. In addition, Newbury skated in seven games with the Rangers last season. He made his season debut with the Blueshirts on October 18 at Vancouver. Newbury has registered eight points (four goals, four assists) and 123 penalty minutes in 66 career NHL games over six seasons with the Rangers, Detroit Red Wings and Toronto Maple Leafs. He made his NHL debut on December 23, 2006, against Washington, and tallied his first career point with a goal on January 1, 2007, against Boston. The 5-11, 205-pounder has skated in 529 career AHL games over nine seasons with the Connecticut Whale/Hartford Wolf Pack, Grand Rapids Griffins, and Toronto Marlies/St. John’s Maple Leafs, registering 122 goals and 255 assists for 377 points, along with 1,205 penalty minutes. Newbury established career-highs in assists (44) and tied his career-high in game-winning goals (five) with Connecticut in 2010-11. In postseason play, Newbury has recorded seven goals and 15 assists for 22 points, along with 143 penalty minutes in 44 career games with Connecticut and Toronto/St. John’s. He established career-highs in games played (19), goals (four), assists (nine), and points (13) with Toronto (AHL) in the 2008 playoffs. 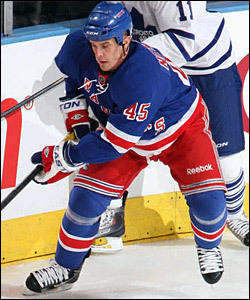 The Brampton, Ontario native was acquired by the Rangers from Detroit in exchange for Jordan Owens on March 3, 2010. He was originally selected by San Jose as a fifth round choice, 139th overall, in the 2002 NHL Entry Draft.